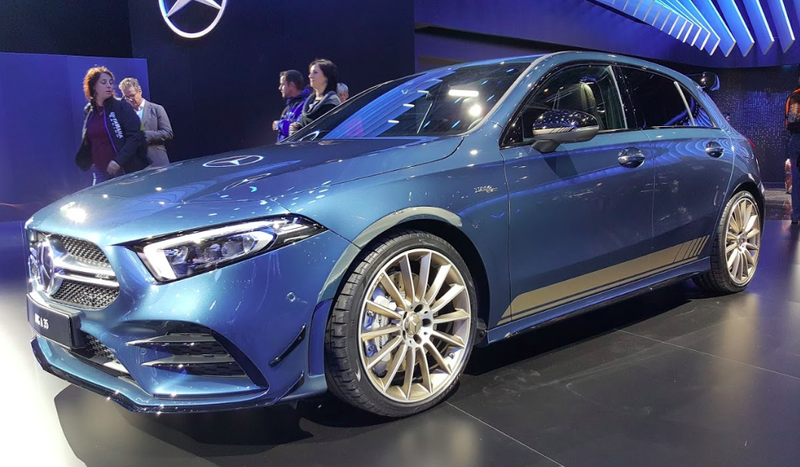 Mercedes physically revealed the Mercedes-AMG A35 yesterday in Paris after debuting it online a few weeks back. I had a chance to sit in the little hot hatch today, and now I deeply need to drive this little oddball of a car. It’s got a fancy Mercedes infotainment system sitting on a swanky Mercedes dashboard, but then it’s got a giant wing, prominent dive planes, and “sporty” decals on the side. I don’t get it, but I want to. This Mercedes-AMG is based on the new front-drive platform underpinning the new A-Class, but compared to the old car the front end has been stiffened, a 306 horsepower engine has been slapped in to power all four wheels, the brakes have been upgraded, and the exterior styling has gone even more nuts. And then there are the giant 19-inch wheels with sizable 14-inch drilled discs in the front and 13-inch drilled discs out rear. Crazy on the outside, serious and luxurious on the inside is a good thing. Too many folks grow out of their WRXs and GTIs as they get older, and opt for something a bit more polished and comfortable. Now they can do that without having to give up the joys of driving a hot hatch. Well, maybe. We’ll have to see how this thing drives first, though sadly, that may not matter to most Americans. Because this weird little Mercedes isn’t coming stateside. Still, if I have to fly to Germany to get time behind the wheel of this 4.7 second-to-62mph hot hatch, I’ll do it. I need to see if the handling lines up more with the car’s comfy interior or its absurd exterior. I’m hoping it’s the latter.